Meet Polka Dots the Clown and her friends as they take you on a fun ride! Let's get it started! Hey Parents, whether it's a fun afternoon play date or a sleep over party this DVD is the perfect idea that will turn any frown upside down! 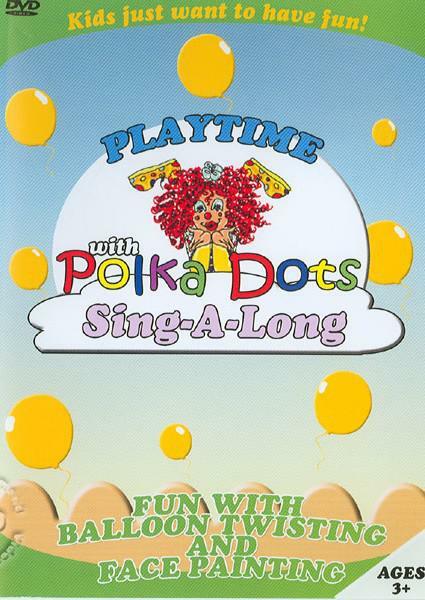 Polka Dots and her friends will sing songs, show you magic tricks and how to turn balloons into your favorite fun animals! Let's sing along to all your favorite versions of kid's songs including: "The Itsy Bitsy Spider", "Old Macdonald Had A Farm", "B-I-N-G-O", "Hey Ya", "Yellow Submarine" and lots more! The purpose of this DVD is that children of any age can enjoy it so whether your child is three or eight they all will have a great time!